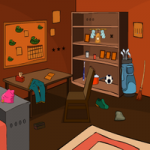 GFG The Room Escape 2 is the second episode of this point & click escape game series developed by GenieFunGames. In this game, you have been locked up in a room again, but you don't know the reason. Before you're going to detect the person who locked you up, you have to escape from this place. You can find useful stuff and clues for interesting puzzles to solve and finally escape from the room. Good luck and have fun! playing again catching up games I missed (yesterday & even earlier), but a live one is always the best - anyone else here to join me? Hi Dazz! Long time no see; glad you´re still there!